Sir Tom Jones on "American Idol" Tom looked terrific — must be because at the moment he can bask at his leisure in the California sun. He also sounded great and, as is proper, allowed the contestants to take the spotlight, even encouraging him and enjoying their version of the “Carlton” dance. They do the “usual suspect” songs — Kiss, She’s A Lady, Green Green Grass, Pussycat, Delilah — but it was a nice surprise when contestant Jacob Lusk sing Love Me Tonight. After I amused myself with people watching for a while, I headed in to Nokia to what, honestly, ended up being one of the most entertainingly random concerts I’ve been to in quite a lot time: Lil’ John and…TLC! Tony Bennett! 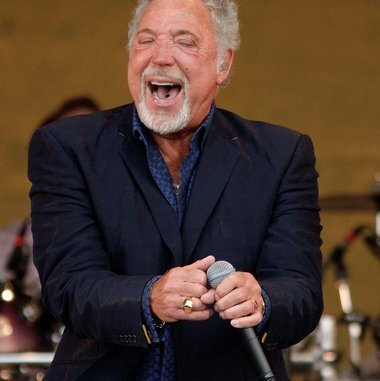 TOM JONES! Beyoncé — twice! In fact, the whole Scotty-or-Lauren thing seemed almost like a footnote to all the performances and other festivities that were going on. I’ll give you a run-down of what I observed from the belly of the beast — the truly few things you might not have seen on TV — but I will warn you first: The seat I was in wasn’t all that close to the stage, so the observations are pithy and short.